Anthropogenic activity, such as accidental oil spills, are typical sources of urban mangrove pollution that may affect mangrove bacterial communities as well as their mobile genetic elements. To evaluate remediation strategies, we followed over the time the effects of a petroleum hydrocarbon degrading consortium inoculated on mangrove tree Avicennia schaueriana against artificial petroleum contamination in a phytoremediation greenhouse experiment. Interestingly, despite plant protection due to the inoculation, denaturing gradient gel electrophoresis of the bacterial 16S rRNA gene fragments amplified from the total community DNA indicated that the different treatments did not significantly affect the bacterial community composition. However, while the bacterial community was rather stable, pronounced shifts were observed in the abundance of bacteria carrying plasmids. A PCR-Southern blot hybridization analysis indicated an increase in the abundance of IncP-9 catabolic plasmids. 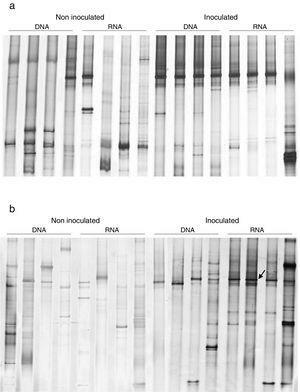 Denaturing gradient gel electrophoresis of naphthalene dioxygenase (ndo) genes amplified from cDNA (RNA) indicated the dominance of a specific ndo gene in the inoculated petroleum amendment treatment. The petroleum hydrocarbon degrading consortium characterization indicated the prevalence of bacteria assigned to Pseudomonas spp., Comamonas spp. and Ochrobactrum spp. IncP-9 plasmids were detected for the first time in Comamonas sp. and Ochrobactrum spp., which is a novelty of this study. We hypothesized that the isolation of bacterial communities which have been regularly exposed to high oil concentrations might show accelerated hydrocarbon degradation, which can be explained by the proliferation of adapted bacteria involved in biodegradation pathways.31 Therefore, we expected that the PHDC inoculation to A. schaueriana grown in sediment artificially contaminated with oil, in comparison to treatments without PHDC would: (i) protect plants against deleterious oil effects, (ii) cause changes in the composition of bacterial populations, and (iii) increase the abundance of plasmids potentially carrying catabolic genes, such as ndo genes, due to the proliferation of indigenous or introduced bacteria carrying catabolic plasmids such as IncP-9 plasmids, or their spread through horizontal gene transfer. In order to prove our hypothesis, the assessment of changes in the bacterial communities over time and the detection of functional genes and plasmids involved in PAH degradation, denaturing gradient gel electrophoresis (DGGE) analysis of bacterial 16S rRNA gene and ndo fragments, detection of ndo gene and IncP-1, IncP-7 and IncP-9 by polymerase chain reaction (PCR) and Southern blot hybridization (SBH) were performed. Tree sampling, rhizosphere processing and PHDC enrichment were performed according to Gomes et al.27A. schaueriana was selected for the phytoremediation microcosm experiment based on previous gas chromatography (GC)-based data, which indicated a significant decrease in the total polycyclic hydrocarbon (PH) concentrations (129.6±62mgL−1) in comparison with the control flasks (301±109.3mgL−1) (p<0.05). This PHDC also showed a high abundance of naphthalene dioxygenase (ndo) genes genotypes and plasmids belonging to the incompatibility (Inc) group.27 In this study, the A. schaueriana rhizosphere PHDC were further characterized, as described below, and were used as the bioaugmentation inoculum in the phytoremediation microcosm experiment. A cultivation-based approach combined with molecular characterization was performed, in order to characterize the bacterial community present in the inoculum, previously used in Gomes et al.,27 applied in the microcosm experiment. The PCR products were purified by using the MinElute PCR Purification Kit from QIAGEN (QIAGEN GmbH, Germany) and 100μM of the primer U8-27′ (AGA GTT TGA TCA TGG CTC AG) (Kornelia Smalla, personal communication) were added to perform the sequencing reaction. The sequencing was performed by the German Company IIT Biotech in Bielefeld, Germany. Primers were trimmed away and chimeric sequences were removed de novo with uChime in uSearch 5.2.32.35 The sequences were compared using BLASTN (http://www.ncbi.nlm.nih.gov/BLAST) and RDP (http://rdp.cme.msu.edu/). Young, six months old, A. schaueriana trees previously planted at the Jequiá mangrove forest located in Guanabara Bay, near the Duque de Caxias Oil Refinery (REDUC) (Rio de Janeiro, Brazil) were carefully removed along with sediment surrounding the roots and replanted into plant pots filled with 500g of sediment each. The sampling site characteristics have been previously described by Gomes et al.18 The artificial oil contamination was performed by covering the plant-mangrove sediment microcosms with 1mL of crude oil emulsified in 9mL of seawater. The following four treatments, each with four replicates, were carried out: treatment 1: plant-mangrove microcosms without addition of oil or inoculum; treatment 2: plant-mangrove microcosms inoculated with 109CFUmL−1 of the total isolated strain from the inoculum (PHDC) (pellets were obtained after centrifugation in 0.85% NaCl for 10min at 5000×g); treatment 3: plant-mangrove microcosms artificially contaminated with 1mL of emulsified crude oil in 10mL of sea water inoculated with 109CFUmL−1 inoculum (PHDC); treatment 4: plant-mangrove microcosms artificially contaminated with 1mL of emulsified crude oil in 10mL of sea water. To expose the microcosms to the high and low tide conditions, as in natural mangroves, all microcosms were partially flooded with seawater for 6h every day. Fresh seawater was directly collected from the Jequiá mangrove. At the end of the flooding period, seawater was leached out by gravitation. The oil-degrading consortium was activated by cultivation in liquid MSM32 supplemented with crude oil (1%, v/v) for 5 days. The biomass production for the plant-mangrove microcosm inoculation was performed by spreading 0.1mL of the pre-activated degrading consortium onto MSM agar plates. Crude oil vapor was used as the sole carbon source by dropping oil on filter paper placed on the lid of Petri dishes. The microbial cells were harvested from the plates by washing with 0.85% saline after 3 days of incubation. The microbial suspension was centrifuged and re-suspended in sterile saline up to 3 times for removal of residual oil compounds. The cell suspension was standardized by optical density at 600nm to achieve a cell density of 109cellsmL−1. Due to the fact that mangrove roots are very sensitive to desiccation and physical damage, the plant-mangrove microcosm inoculation was performed by adding 2mL of cell suspension per each 100g of sediment above the sediment near the base of each plant. The same volume of sterile saline was added to non-inoculated soils to standardize the final moisture content of each microcosm. The microcosm experiment lasted 52 days. Samples were taken just after the inoculation (day 0), and at 7, 21 and 52 days post-inoculation, corresponding to T0, T1, T2 and T3, respectively. Four entire microcosms were analyzed per treatment. The rhizosphere sample consisted of the total root system with tightly adhering sediment of four individual plants. Each rhizosphere sample was cut and thoroughly mixed prior to microbial cell detachment. Extraction of microbial cells from the roots was performed by gently shaking (100rpm) 5g of homogenized root samples in Erlenmeyer flasks containing 5g of glass beads (diameter of ∼4mm) and 45mL of extraction solution containing Tween 80 (0.1%) and sodium pyrophosphate (0.1%) for 30min. After the microbial cells were dislodged from the sediment matrices, 10mL from the supernatant of each sample were centrifuged and the pellets were re-suspended in ethanol (PA) up to a final volume of 2mL and frozen at −60°C until processed for DNA/RNA extraction.39 Only 1mL from this suspension was used for nucleic acid extraction (amount of microbial cell corresponding to 0.5g of fresh sediment). To determine the stress caused in the plants due to the hydrocarbon contamination, we measured chlorophyll a and b and total carotenoid concentrations. Circular discs were cut with a 6.36mm diameter cork bore (approx. 127mm2) from both leaves of the second and third nodes counting from the top down. Each leaf disc, weighing approximately 50mg (wet weight), was placed in a vial containing 6mL of dimethyl sulfoxide (DMSO) and photosynthetic pigments were extracted without grinding at 60°C for 14h in the dark.40 Thereafter, the organic extracts were stored at 10°C and 3mL of DMSO were added to each leaf disc, maintained at 60°C for 4h for further extracting any remained pigments. These nearly colorless extracts were poured into the first ones. Chlorophylls (a+b) and total carotenoids (carotenes plus xanthophylls) were quantified spectrophotometrically according to Wellburn41 after subtracting the turbidity at 750nm. Bacterial 16S rRNA gene PCR amplification was performed as previously described by Heuer et al.42 (product size of 1506bp) from the TC-DNA of microcosm soil samples and the genomic DNA from isolated bacterial strains. PCR products were checked after electrophoresis in 1% agarose gel stained with ethidium bromide under UV light in comparison with the 1-kb gene-ruler TM DNA ladder (Fermentas, St. Leon-Rot, Germany). Quantitative PCR (qPCR) targeting the bacterial 16S rRNA gene from the TC-DNA was performed with the TaqMan system as described by Suzuki et al.44 The bacterial 16S rRNA gene qPCR standard was obtained through a dilution series (10−3–10−7) of the cloned bacterial 16S rRNA gene amplicons (1467bp) from Escherichia coli. From the initial 80 isolates, a screening based on phenotypes and biochemical tests: colony morphology, catalase and oxidase reaction,49 and Gram staining test,50 led to the selection of 35 isolates for bacterial 16S rRNA partial gene sequencing. Based on the partial sequences of the 16S rRNA gene, the bacterial strains were identified as Pseudomonas spp. (20), Ochrobactrum spp. (6), Comamonas spp. (5), Achromobacter spp. (2), Bacillus sp. (1), and Pseudoacidovorax sp. (1). The bacterial 16S rRNA amplicon sequences have GenBank accession numbers KX061935–KX061969. The presence of plasmids and ndo genes were confirmed by dot blot hybridization analysis performed with the PCR products with predicted band sizes of each of the amplicon targets. PCR amplicons and Southern blot hybridization (SBH) signals of the predicted sizes corresponding to IncP-1 plasmids were obtained for five isolates. Most of the isolates (11), showed PCR amplicons and SBH signals corresponding to IncP-9 plasmids (Supplementary S1), while six showed signals indicating the presence of ndo genes (Supplementary S2). Only one isolate showed the presence of IncP-9 plasmid and ndo gene at same time (Table 1). Identification of bacteria isolated from the petroleum hydrocarbon degradative consortium (PHDC), based on bacterial 16S rRNA gene partial sequence and screening for the detection of incompatibility (Inc) plasmids and naphthalene dioxygenase (ndo) genes trough dot blot hybridization. All sequences of identified bacterial species showed 100% of similarity with the type strains compared in the Ribosomal Database Project (RDP) data base. Negative control was represented by a randomly isolated bacterium from a soil contaminated with oil, which previously PCR-Southern blot hybridization analyzes showed the absence of IncP-1, IncP-7 and IncP-9 plasmids. (+) possible variation of the ndo detected. In order to evaluate the potential of the inoculated PHDC to protect A. schaueriana mangrove plants against the phytotoxicity induced by artificial contamination with petroleum, symptoms such as the numbers of leaves with blight lesions and plant length at the initial time point (T0) and at the end of the experiment (T3) were measured and compared. The results indicated that none of the analyzed leaves displayed blight lesions, and only weak symptoms in five leaves were observed in one replicate (3.1) of the inoculated plants artificially contaminated with oil at the end of the experiment (T3) in the control (1) and in inoculated plants without oil (2). On the other hand, all plants artificially contaminated with oil (4) displayed several leaves with blight lesions: six, three, nine and four leaves respectively, from 4.1, 4.2, 4.3 and 4.4 at the end of the experiment (T3) (Fig. 1). Effects of PAH contamination on A. schaueriana mangrove tree stems and blight lesions after 21 days of contamination with crude oil. (A) controls, plants without inoculum and oil; (B) inoculated plants; (C) inoculated plants artificially contaminated with 1mL of emulsified crude oil in 10mL of sea water; (D) plant artificially contaminated with 1mL of emulsified crude oil in 10mL of sea water. In order to evaluate A. schaueriana stress caused by the artificial addition of petroleum, pigment extractions from the initial time point (T0) and the end of the experiment (T3) were performed. The results of these pigments, total chlorophyll (a+b) and total carotenoids, indicate that, except for the control plants (1), all other treatments, 2, 3 and 4, respectively – inoculated plants, inoculated plants artificially contaminated with oil, and plants artificially contaminated with oil – resulted in a decrease of chlorophyll (a+b) levels and, to a lower degree, in a decrease of total carotenoids. The occurrence of plant stress is indicated by the ratio of chlorophyll divided by the total carotenoid concentrations, which, in the present study, decreased significantly from the ratio of 6.2mg/m2 (control) to 5.2mg/m2 in the other treatments (2; 3; 4) at the last sampling timepoint. In order to estimate the bacterial abundance of the mangrove microcosm samples, the 16S rRNA gene copies were determined by qPCR from soil TC-DNA extracts. All samples (Table 2) showed a high abundance of bacterial populations ranging from 108 to 109 bacterial 16S rRNA gene copy numbers per gram of microcosm soil samples with no significant differences between the treatments (Tukey's test, p<0.05). Bacterial densities and PCR-Southern blot hybridization detection of plasmid replicon-specific sequences belonging to the IncP-1, IncP-7 and IncP-9 groups. Hybridization signal: (+++) very strong, with exposure time up to 5min; (++) strong, with exposure time up to 1h; (+) weak, with exposure time up to 3h; (−) none, with exposure time of more than 3h. Average arithmetic of 4 replicates. Time 1=7 days after inoculation; Time 2=21 days after inoculation. Treatment 1.1; 1.2; 1.3 and 1.4: control, plants without inoculum and oil; treatment 2.1; 2.2; 2.3 and 2.4: inoculated plants; treatment 3.1; 3.2; 3.3 and 3.4: inoculated plants artificially contaminated with 1mL of emulsified crude oil in 10mL of sea water; treatment 4.1; 4.2; 4.3 and 4.4: plant artificially contaminated with 1mL of emulsified crude oil in 10mL of sea water. To evaluate the effect of oil and PHDC on the bacterial community composition over time, a DGGE analysis was performed of bacterial 16S rRNA genes amplified from TC-DNA extracted from the four microcosm treatments from samples taken after 7 and 21 days of growth in the greenhouse. The bacterial DGGE fingerprints (Fig. 2a and b) showed a high stability of the bacterial community over time, without detectable variation among replicates and treatments. The UPGMA cluster analysis of the DGGE patterns did not detect any significant difference between the two sampling times for the bacterial diversity between the different treatments over time (Fig. 2a and b). The permutation test analysis of total bacterial DGGE fingerprints revealed no significant differences in the composition of these communities between the different treatments and incubation times. The DGGE analysis data is only shown for the time point after seven (T1) and 21 (T2) days of inoculation in congruence with the time points analyzed by the others molecular analysis (ndo-DGGE fingerprints of DNA and cDNA genes and Southern blot hybridization of catabolic plasmids). Comparison of the bacterial community structures by DGGE based on bacterial 16S rRNA. S: (S) Standard bacterial 16S rRNA; (1) controls, plants without inoculum and oil; (2) inoculated plants; (3) inoculated plants artificially contaminated with 1mL of emulsified crude oil in 10mL of sea water; (4) plant artificially contaminated with 1mL of emulsified crude oil in 10mL of sea water. In this study, an ndo gene fingerprint approach18 was used to evaluate the effect of oil contamination and bioaugmentation on the diversity and expression of polycyclic aromatic hydrocarbon (PAH) degrading genes. Based on the band profiles, the comparison of ndo-DGGE fingerprints of DNA and cDNA revealed that both indigenous and introduced bacteria were able to express the genes coding for PAH degrading enzymes in the sediment rhizosphere (Fig. 3a and b). However, the appearance of dominant bands in the cDNA of inoculated treatments was observed, with the most intense signal on day 7, indicated the dominance of a specific ndo gene in the inoculated treatments, with high abundance and expression on day 7. Comparison of DNA and RNA (cDNA) DGGE ndo fingerprints of the mangrove microcosms artificially contaminated with petroleum at 7 (A) and 21 (B) days after contamination. Microcosms with and without inoculation are shown. Arrow indicates the ndo gene type introduced by inoculation. From the TC-DNA, Southern blot hybridization (SBH) with labeled probes generated from specific PCR-amplicons from the TC-DNA were applied in order to avoid the detection of false-positive results which might occur in a conventional PCR amplification.51 In order to detect the occurrence and temporal and treatment-dependent changes in the abundance of IncP-1, IncP-7 and IncP-9 plasmids, SBH analysis were performed. PCR amplicons and SBH signals of the predicted sizes were not obtained for IncP-7 plasmids (Table 2). However, weak, strong and very strong signals were detected for IncP-1 and IncP-9 plasmids. While SBH of IncP-1 signals were detected without variation over time and between the different treatments, SBH of IncP-9 signals increased in response to the addition of the PHDC consortium in oil polluted treatments over the time. The SBH analysis results indicated higher IncP-9 plasmid abundance in the oil treatment, displaying the strongest signals (S3) in treatment 3 with the respective replicates on day 7 (T1), decreasing IncP-9 plasmid abundance after 21 days (T2) (Table 2). 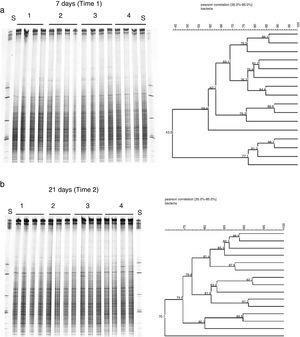 Southern Blot-PCR-based detection of Inc plasmid analysis data is only shown for the time point after seven and 21 days of inoculation, due to the absence of variation from the day 21 (T2) and at the end of the experiment, after 52 days of inoculation (T3). IncP-1 plasmids are a broad host range and have been observed in a wide range of hosts, such as Achromobacter xylosoxidans, Burkholderia cepacia, Cupriavidus necator, Pseudomonas sp., Sphingomonas sp. A1, Variovorax sp.,57 while IncP-9 is well known to be a narrow host range plasmid, mainly occurring in Pseudomonas.58 However, IncP-9 was detected in bacteria from other taxonomic groups for the first time here: in Comamonas aquatica and in two different Ochrobactrum spp. species. These are very interesting findings, which may also indicate that environmental pressure over time might have fostered the adaptation of other hosts by the uptake of IncP-9 plasmids, in order to increase bacterial survival under stressful conditions. The use of bioremediation to accelerate the rates of petroleum components degradation has many successful examples, such as the case of the Exxon Valdez oil spill in Prince William Sound59 and the oil spill in the northern Gulf of Mexico.60 The results obtained in these cases have demonstrated that the stimulation of the indigenous bacteria able to degrade hydrocarbons by adding fertilizer significantly enhanced petroleum degradation rates and shaped the function and structure of bacterial communities.61 The use of plants to enhance the bioremediation of petroleum hydrocarbons at contaminated soil sites, at a pilot-scale, demonstrated the relevant role of rhizosphere-associated microbes in the petroleum components degradation.62,63 The bioaugmentation strategy used in the present greenhouse microcosm indicated promising results and can be further explored in future field phytoremediation experiments of polluted mangrove ecosystems. The short-term effects of oil addition in association with the PHDC inoculation were evaluated under both aspects: structure and functional level. Firstly, in order to unravel and assess the changes in the structure of bacterial communities, a culture-independent method, the PCR-DGGE fingerprint technique, which is a suitable technique to access the structure of bacterial and archaeal communities of mangrove trees,64 was applied. Pyrosequencing analysis of bacterial 16S rRNA gene amplicons already showed that most of the microbial community of mangrove trees involved in oil degradation were assigned to Bacteria, with highest abundance related to Proteobacteria,65,66 which guided our focus to the comparative analysis of bacterial communities inhabiting the rhizosphere of mangrove trees. Based on the appearance of several DGGE bands in both analyzed sampling times, bacterial PHDC fingerprints indicated a high complexity of different bacterial populations. These results are indications of the adaptation of a high number of populations able to survive in the presence of PHs. These findings are in accordance with the results reported by Gomes et al.,27 which revealed a higher number of bacterial populations adapted to growth on PH, inhabiting the rhizosphere, in comparison with the complexity found in the bulk sediment. Analysis of photosynthetic pigments (chlorophyll a, chlorophyll b and carotenoids) are often performed to indicate plant stress.67 In comparison with the control plants at the end of the experiment (T3), the chlorophyll/carotenoid ratio (total chlorophyll over total carotenoid) showed increased plant stress for all other evaluated treatments indicating plant metabolism alterations induced by the inoculated microorganisms. On the one hand, pigment analysis did not indicate a decrease of plant stress induced by oil due to the PHDC inoculation. On the other hand, plant symptoms observed in leaves indicate protection against oil-induced phytotoxicity.68 Our results thus demonstrate that bacterial communities able to partially or totally degrade PHs inoculated in the greenhouse microcosm plants could improve A. schaueriana health, protecting this species against the phytotoxicity induced by the artificial contamination with petroleum. 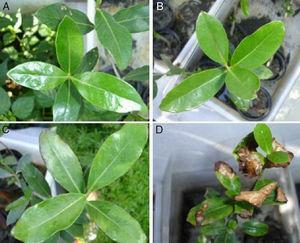 Inoculated plants showed only weak symptoms in five leaves in one replicate, while the non-inoculated plants showed several leaves with blight lesions (Fig. 1), indicating the protective effect of the inoculation with PAH-degrading bacteria in the presence of oil. The absence of significant differences in plant length measured at the end of the experiment (T3) (data not shown) between the non-inoculated and inoculated plants can be explained by the use of trees originated from a polluted urban mangrove, which likely carried oil-adapted bacterial communities, enriched catabolic plasmids and PAH degrading genes.27,31 The frequent addition of petroleum to a microcosm tends to affect the microbial communities present in this environment, which also occurs in situ, in different polluted mangroves.23 The selection of PAH-degrading bacteria occurs in order to maintain the health and balance of this ecosystem. The shifts in the structure of pre-adapted bacterial communities to long-term oil pollution tending toward lesser diversity, but more specialized and adapted microbial communities, have been previously reported,45,69 in accordance with the bacterial community stability shown in both treatments, as revealed by the DGGE analysis herein. Although SBH does not provide quantitative information on specific gene copy numbers per gram of material as does qPCR, changes in the abundances of the different plasmid groups can be indicated and are often confirmed by amplicon pyrosequencing, as demonstrated in other studies involving the biodegradation of organic pollutants.24 On the basis of the exposure time of the identical blots hybridized with digoxigenin-labeled probes generated from reference plasmids (S1), it was shown that the bacteria carrying IncP-9 plasmids were highly abundant in treatment 3, which received both oil and the PHDC inoculum. The comparison between the bacterial 16S rRNA gene copy numbers by qPCR indicated that these differences were not due to differences in bacterial abundance among the samples. Several other studies have demonstrated the role of IncP-9 plasmids in the adaptation of the bacterial communities to PAH contamination in situ.58,70 The high abundance of the IncP-9 plasmids observed in the present study confirmed previously reported findings20 which indicate that IncP-9 plasmids often carry genes involved in the degradation of natural contaminants, e.g. ndo gene products responsible for different PAH degradation steps.18 The exposure of mangrove bacteria to PAH for a longer period of time might have fostered adaptations to rapidly changing environmental conditions via horizontally acquired MGEs.31 No treatment-dependent changes in the abundance of IncP-1 plasmid carrying populations were observed, which is not surprising, since it is well known that this plasmid group often encodes genes involved in man-made pollutants, e.g. pesticides20 and not natural organic pollutants like petroleum. It is well known that the important multicomponent enzyme system involved in PAH degradation, ndo genes, present a huge genetic variability which complicates their detection in environmental samples. However, in order to overcome this limitation, primers which target the ndo alpha subunits belonging to the main clade of group III, comprising several ndo genes, including the nahAc and phnAc genes, were applied.18 PCR-based primer systems targeting a broad range of ndo genes were applied, and it was shown that the enrichment with microbial PAH genes indeed offered plant protection through the insertion of specific ndo genes as visualized by DGGE. The comparison of ndo-DGGE fingerprints of DNA and cDNA revealed that both indigenous and introduced bacteria were able to express the genes coding for PAH-degrading enzymes in the rhizosphere. However, due to the presence of dominant bands in the DNA and cDNA in the inoculated treatments, it can be suggested that specific ndo genes are present which are only expressed under high levels of oil pollution and have an earlier activity, as the band intensity was higher on day 7. In conclusion, the data reported herein indicate that, due to the previous selection of bacterial consortia able to survive by using petroleum as carbon and nitrogen sources, the addition of petroleum did not change the composition of a bacterial community pre-adapted to PAH, in a greenhouse microcosm experiment over time. However, while the overall bacterial community composition did not significantly shift based on the methods used, changes in the abundance of conjugative plasmids and PAH-degrading genes were observed, indicating that horizontal gene transfer is a crucial parameter in the development of effective PAH-degrading microbial communities occurring in urban mangrove soils. It was shown that mangrove roots provide a suitable environment for the expression of PAH-catabolic genes expression. The results of this study aid in elucidating the response in bacterial community composition to oil contamination in mangrove ecosystems, indicating that a bioaugmentation strategy mediated by highly efficient PDHC can be a useful tool to clean-up the environment, with certain advantages, such as low implementation and maintenance costs. The main novelty of this work regarding the PDHC results is that Comamonas sp. (Betaproteobacteria) and Ochrobactrum sp. (Alphaproteobacteria) carrying IncP-9 plasmids are reported here for the first time. Thus it seems that under condition with strong selective pressure the host range of IncP-9 plasmids is far broader as previously reported. DGGE71 is a fingerprinting technique which allows to analyze rapidly and in a cost-effective way the structure and dynamics of microbial communities. Herein DGGE provided important information, which indicated that the abundant bacterial communities analyzed were stable over the time likely due to their pre-adaptation to oil. Commonly to every independent of cultivation technique, DGGE has its limitations such as the limit to detect only the most abundant microbial communities (>1% of the total community), not including some of rare species or those below to the detection limit, which can play an important role in PAH degradation. However, previous work2 based on the study of microbial communities from mangrove contaminated with oil indicated the absence of difference in the results revealed by DGGE and barcoded pyrosequencing. Nevertheless, would be interesting future amplicon analysis by next generation sequencing technologies for comparison with the data shown here and to provide information on the taxonomic affiliation of the dominant bacterial community members. Based on the knowledge that sometimes a certain gene can be present but not expressed, DGGE analysis of ndo amplified from cDNA, instead only DNA analysis of ndo genes, brought a more complete and useful information, indicating not only the presence of ndo genes but also their expression of SBH has many advantages, as it provides insights into the prevalence and diversity of plasmids and genes in a larger numbers samples. When compared to the conventional PCR, which can also amplify non-specific products, SBH significantly increases the specificity and sensitivity of detection.72 Therefore, herein the PCR-based detection combined with SBH revealed intense shifts in the MGEs of bacterial communities, indicating the increased abundance of MGEs which might be due to the proliferation of bacterial populations carrying MGEs or due to horizontal transfer processes. In summary, this study provided novel data about the host range of IncP-9 catabolic plasmids, which were found for the first time in Comamonas sp. and Ochrobactrum spp. Furthermore, this study demonstrated that the PHDC inoculated in the greenhouse microcosm plants protected the A. schaueriana plants against the phytotoxicity induced by the artificial contamination with petroleum. Our results indicated that studies focusing on PHDC development and its application in bioaugmentation can be an interesting approach to promote mangrove environment detoxification and recovery after an oil spill accident. Acknowledgments are due to PNPD-CAPES (Brazilian Ministry of Education) and CAPES for scholarship support given to S. Dealtry and A.M. Ghizelini. This study was funded by the Deutsche Forschungsgemeinschaft SM59/4-1 and 4-2 and by FAPERJ-Brazil. Bacterial diversity of soils assessed by DGGE, T-RFLP and SSCP fingerprints of PCR-amplified 16S rRNA gene fragments: do the different methods provide similar results?